There are currently 111 people online. 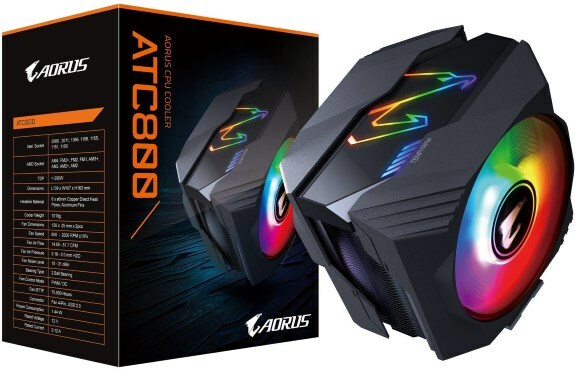 Details leaked about the AORUS ATC800, a new HSF from Gigabyt's gaming brand. This large tower heatsink features six direct-touch 6mm thick nickel-plated copper heatpipes and an aluminium fin array that is cooled by two 120mm double ball-bearing fans. The fans spin at 600 to 2000RPM, which results in an airflow of 14.05CFM to 51.7CFM at a noise level of 18dBA to 31dBA. The ATC800 measures 139mm x 107mm x 163mm and weighs a whopping 1.01kg. It's rated at 200W TDP and supports Intel LGA115x/LGA2066 and AMD Socket AM4 processors. Gigabyte says the cooler offers good compatibility with RAM modules thanks to 37.mm of clearance to the memory module installed closest to the CPU socket. Special features include RGB LED lighting in the two fans as well as a top-plate with an RGB LED diffuser. All three RGB LEDs can be controlled via a single 3-pin RGB header.